Bushmaster Wilderness Conqueror Fixed Blade Knife with Nylon Leg Sheath | BUDK.com - Knives & Swords At The Lowest Prices! 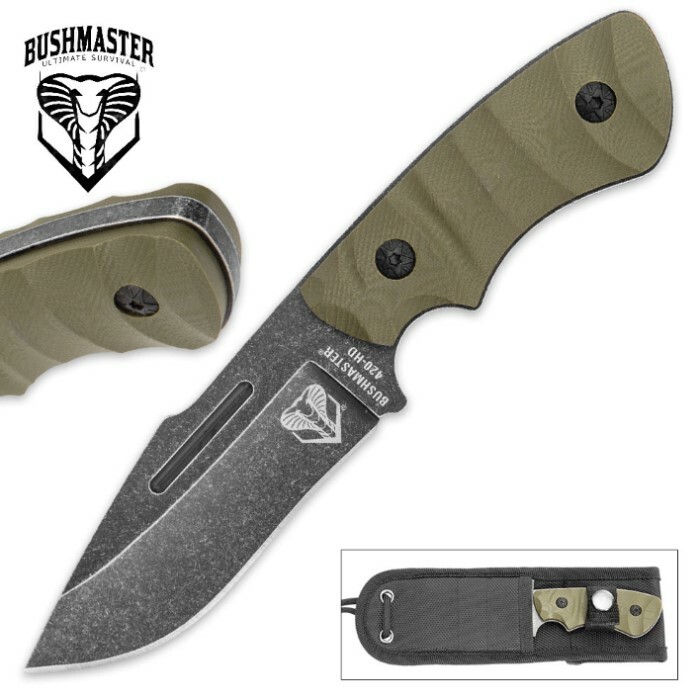 Easy to wield, quick to brandish and tough as nails, the Wilderness Conqueror Fixed Blade Knife from Bushmaster will be the tool you reach for the first time, every time, come what may - emergency, day-to-day cutting tasks and everything in between. It boasts a razor sharp 3 1/2" 440 stainless steel blade with a sleek spine fuller, rugged stonewashed finish and a cool etching of the iconic "Bushmaster Cobra." Thick and robust, the full tang blade can tackle the most demanding jobs in the harshest of conditions without breaking or sacrificing its finely honed edge. Rest assured the Wilderness Conqueror Fixed Blade will be there for you at full potency no matter where you take it or what you put it through. And you'll want to put it through a lot! 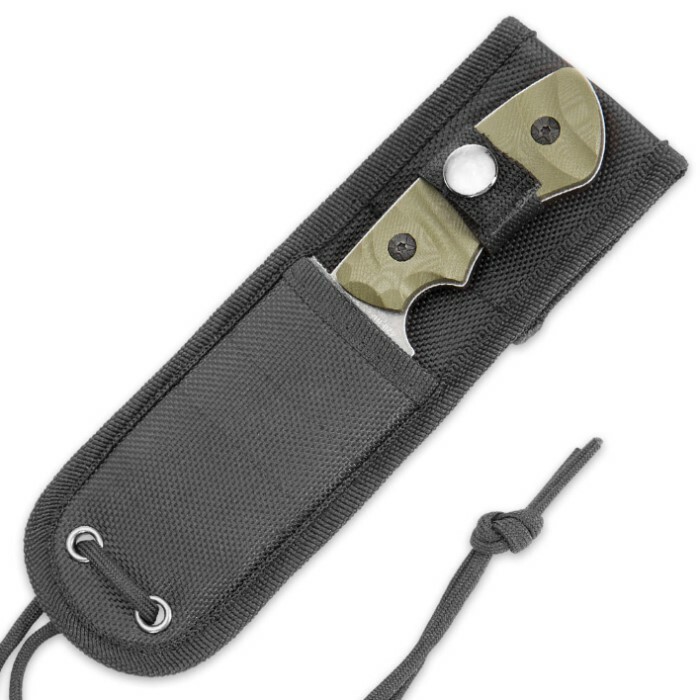 The Wilderness Conqueror is a pleasure to wield, with impeccable balance and weight distribution, and a finely textured, army green G10 handle that fits any hand like a glove. Best of all, it's a quick and easy draw! Face it - tough materials, extraordinary design and cutting-edge engineering is altogether worthless if your knife is difficult to reach or cumbersome to pull out in an emergency. Thankfully, the Wilderness Conqueror is neither. Using the attached nylon cord, easily secure the convenient black nylon leg sheath at the perfect position for your individual height, range-of-motion and draw style; you'll be floored by how swiftly and smoothly you'll be able to brandish that 7” bad boy! Such speed and finesse is crucial in tactical scenarios or the wilderness, where mere seconds can mean the difference between life and death. 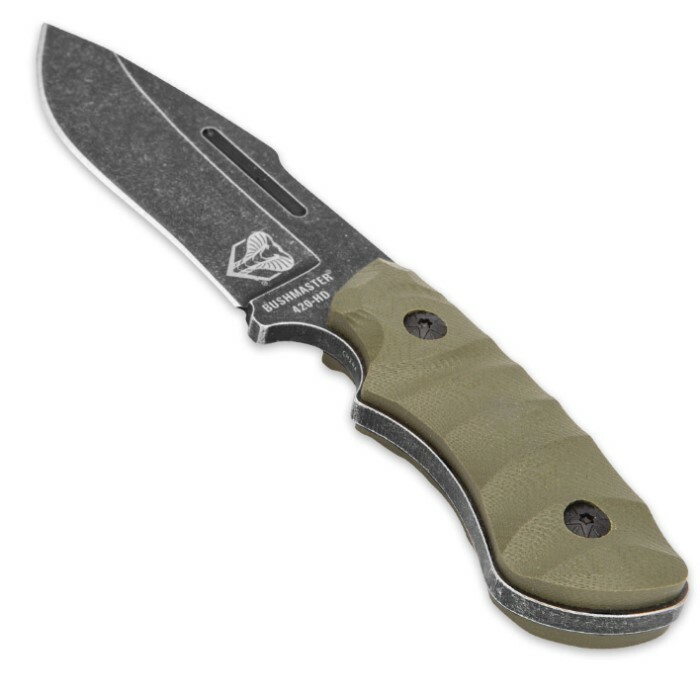 If you're an outdoorsman, tactician, camping enthusiast, survivalist, pepper or just a guy (or gal) who needs an effective, dependable fixed blade knife, Bushmaster's Wilderness Conqueror will be your best friend. For deep in the woods or around the house, it's the go-to blade that "conquers" any cutting job, large and small.